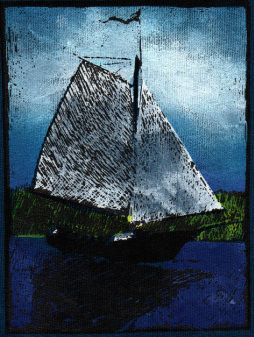 Hand Printed Works are created by artists Marie and Tim Reimensnyder at their home in New Gloucester Maine. Their imagery is inspired by life in rural Maine. We print using an environmentally friendly process with water based inks and paints . 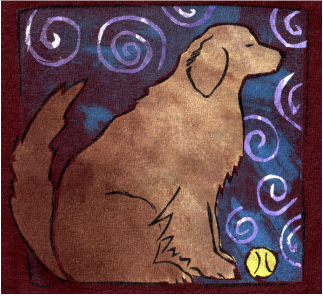 The work is a combination of hand screening , stenciling and painting. Stencils are cut from recycled mylar sheets. Colors are mixed on a palette . Stenciling is done with brushes, sponges, toothbrushes ... anything that results in a variety of textures. Finally, a fine tip brush or tool is used to create line and detail. The pieces are heat set and machine washable. All work is original art, meaning the artist has actually worked on the printing surface. Each piece is signed and dated when complete. Everyone is slightly unique. We hope you enjoy them! Are you interested in a custom design? or wholesale?